Do you like magic? Here are two books full of photos with two masterpiece magic routines! The typical research is to write down the sample text, for example in Microsoft Word, and then scroll the fonts dropdown menu to see how the text changes. 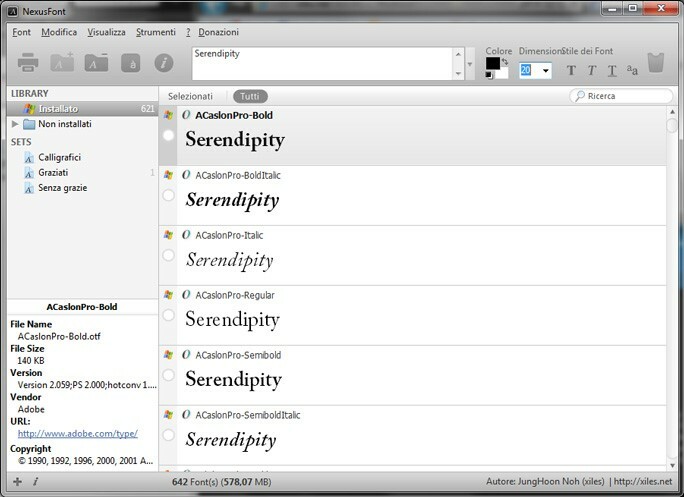 we can try only the installed fonts and not the ones, that for not overloading the system, we keep in separate libraries. finally there are some that let you do all the previous things, but only with installed fonts (e.g. browser based MyFontBook). After a long research I found NexusFont, an application create by the Korean Noh JungHoon: it's well done, it's exactly what I was looking for... and it's free. there's also an iPhone versione. Considering that exist emblazoned application for sale that do not have all these features, to give him a round of applause is almost an obligation. You are the reader number 4,859.